I've been dreaming of fixing up the exterior of our house. It's a 1955, flat roof house painted the dullest beigey, yellow you can imagine. When we had our roof done, we had them stain the cedar fascia boards instead of having them painted. The intention was good, but then life got in the way. I would love to paint the exterior white, and add some color to our front door. We have a wooden walkway up to the house that needs to be replaced and some 1970's octagonal brown ceramic tiles that are horrible. There's something about this image below that is calling me. Currently, my house looks NOTHING like this, but a girl can dream right?﻿﻿ I love the modern feel, the wood, the grey, the red door, and of course, the white. ﻿﻿So now, let's pretend my house was three times its size, maybe it could look like this. For now, I will use the wood as my inspiration for my walkway and the white walls. How about this one. I want a pool and I want it to look like this. Oh, yea, I want my house to look like that too. What do you think of white houses? Will it be a pain to upkeep? I am redoing a 70's brick house right now that is pink brick (not in a good way). Anyway, I'm thinking about painting in a chalky white so I'll be interested in hearing your readers comments! I love white everything. Might be a bit tough but if you use a semi-gloss it helps. I just painted mine in a creamy white color that my husband picked and to be honest I wish I went more on the white side! Oh well. I also love those back yards. We just framed our patio and poured concrete on the boarder and will be doing wood inside. Those pictures are exactly what I'm shooting for. Love it! I painted my house a dark beige, but did the borders/accents in white and they get dirty. Solution: once a month hose it down with jet stream pressure from the hose. It's tedious but it works. My windows are white too, but to get the dirt off, I have a special soft brush window cleaner that takes it right off. It's also tedious, but looks so nice. I did it for about a year, but now it's on the housekeeper's to do list. I agree with you: the modern feel in the first photograph is very appealing. From this perspective, I get the impression of harmony between the inside and the outside of the house. Brilliant! 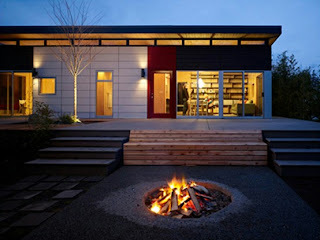 When it comes to beautifying the exterior of your house, you won’t find it difficult to come up with wonderful ideas. You can get a lot of inspirations from magazines, home renovation programs, and photos online. You can get insights from those and who knows? You may be able to come up with your very own ideas as well!